‘Athena Rising’ and has been created on the side of the Platform building in Leeds, which has been clad with StoTherm Vario external wall insulation and finished with StoColor X-black facade paint. The ambitious and bold artwork depicts an owl in flight alongside a moon and a crown, and has been created by artists Cbloxx and AYLO, also known as Joy Gilleard and Hayley Garner, from the Nomad Clan muralists collective. Taking four weeks to complete, ‘Athena Rising’ covers the east elevation of the building, and it saw Joy and Hayley working from a suspended cradle, hand-painting the artwork using emulsion and spray paint. Dark finishes on render applied over external wall insulation have traditionally suffered from heat build-up due to solar gain. This can subject the render and insulation to temperatures of up to 80°C, which causes dimensional instability, cracking and damage to the insulation. However, the StoColor X-black paint uses special near-infrared black pigments that cause much of the solar energy in the invisible near-infrared spectrum to be reflected. Despite the render surface being dark in colour, it stays considerably cooler, protecting both the render itself and the insulation material beneath it from the extremes of thermal stress. 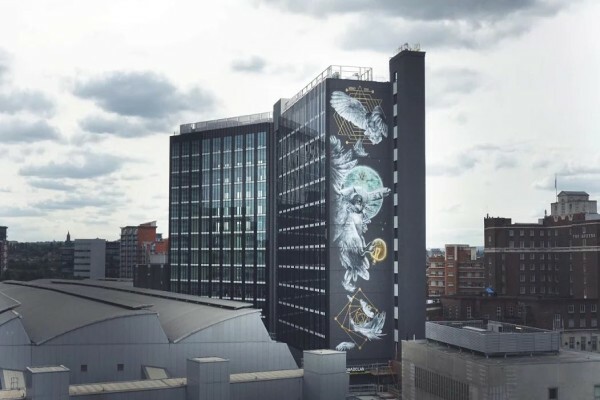 “We’re very excited to be part of this project and pleased that Platform can provide the canvas for this mural,” adds Craig Burrow of the building’s owner, Bruntwood. “Bruntwood firmly believes that the strength of our cities is directly impacted by social and cultural vibrancy, so it’s great to see citywide projects like ‘A City Less Grey’ bringing organisations from across the region together to create powerful art.